The gated community of Riegels landing is located just north of the Midnight Pass Road and Beach Road intersection on the bay side of Siesta Key. The waterfront homes in this community have some of the best views of the Intracoastal Waterway. The opposite side of the waterway is a lush mangrove forest affording residents of Riegels Landing a high level of privacy. The interior waterfront homes feature unobstructed boating access to the Intracoastal Waterway and Roberts Bay. The canals serving Riegels Landing are wide making them easy to navigate and suitable for larger watercraft. If you enjoy a boating lifestyle, the homes in Riegels landing will be perfect for you. 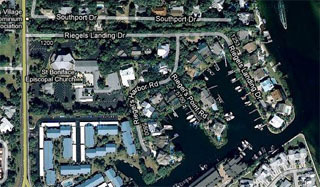 Riegels Landing homes range in price from $600,000 to more than $5 million for the palatial homes along the waterfront. Floor plans vary between 2,500 square feet to more than 5,000. Many of the homes in the neighborhood were built in the 1980s and their styles and designs reflect that period. Lot sizes are generous, most range between one quarter and one half of an acre. For beach goers, Riegels Landing an easy bike ride to Siesta Key Beach. St. Boniface Episcopal Church borders the community to the east; the gate to Riegels Landing is located just north of the Church. Below are all of the current real estate listings available for sale in Riegels Landing as of 6AM this morning.